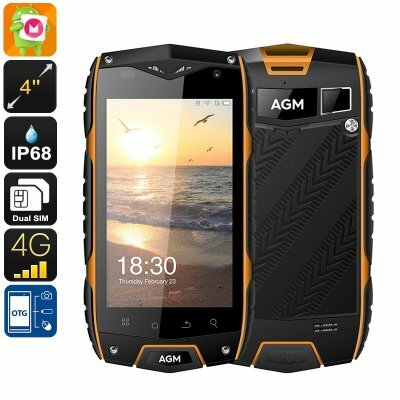 Successfully Added AGM A7 Rugged Phone - IP68, Dual-IMEI, 4G, OTG, Quad-Core CPU, 2GB RAM, Android OS, 8MP Camera, 4 Inch Display to your Shopping Cart. If you are looking for a durable and cheap Android phone, the AGM A7 is perfect for you. This Rugged smartphone features an extremely tough body that has been rated IP68. Thanks to this, your Android phone is protected against water, dust, and drops. The next time you head outside, you can carry along this waterproof phone with confidence. No matter where you’re headed, there is virtually nothing that will stop this rugged phone from working. On its sophisticated 4-Inch display, you will be able to enjoy all your phone’s features at any time. Whether you’re at home or out in the wild – you’ll never have to feel bored again. Within its rugged body, this waterproof smartphone packs a 2930mAh battery. This cell brings forth enough power to get you through the most intensive of days. You’ll be able to play games, watch movies, and browse the web. The sophisticated hardware of this cell phone supports media without dropping a frame. Thanks to its Quad-Core processor and 2GB RAM, you won’t have to worry about slowing down your device while enjoying your favorite media. 16GB internal memory and a 32GB SD card slot offer plenty of space for you to store all your files. The AGM A7 Android phone brings along great connectivity. Dual-IMEI numbers let you be reachable on two phone numbers at all time. It furthermore supports the fastest data speeds out there thanks to 4G. This means that you’ll always be able to browse the web and stay in contact with your loved ones no matter where you’re at. The next time you head out, you’ll always be able to contact your friends and family back home. In order to let you enjoy your upcoming trips even more, the phone packs a beautiful 8mp camera. This piece of equipment lets you snap stunning pictures and allows you to recall your memories with friends and family back home.